Nathan Yost, son of combat chaplain Capt. Israel Yost, reflected on some of his father's experiences during a ceremony yesterday commemorating the combat chaplains of the 100th Battalion and 442nd Regimental Combat Team. 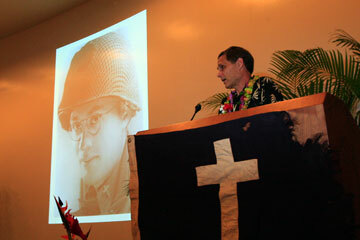 Veterans of the two Japanese-American combat units and the chaplains' families were honored guests at the celebration, hosted by the University of Hawaii-Manoa at the School of Architecture Auditorium. "Their Legacy of Service" is the theme of the program, which applauds the service of Yost, the Rev. Hiro Higuchi and the Rev. Masao Yamada. The Higuchi and Yost families donated the ministers' personal papers and memoirs for the benefit of future students and historians.